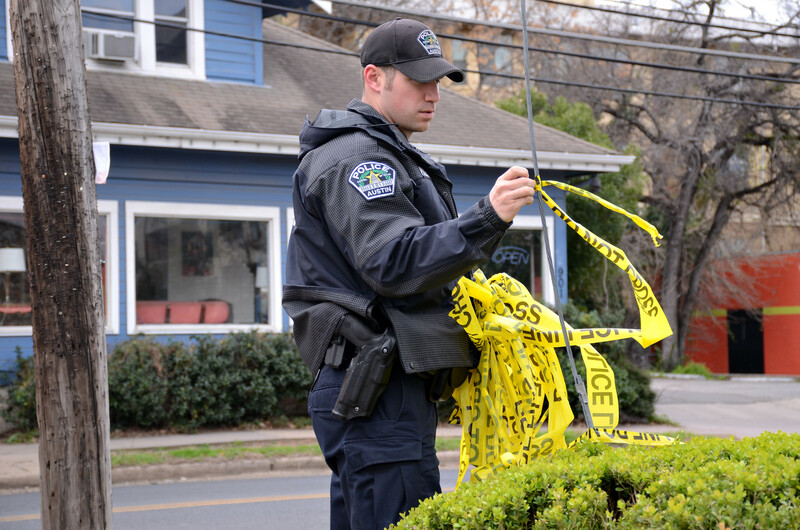 The Austin Police Bomb Squad investigates a bomb threat at Shawarma Republique food trailer on 24th Street. A man being treated for psychiatric disorder called in two bomb threats in the West Campus area Tuesday morning. Updated Story: University administrators waited more than three hours to notify students of two bomb threats reported in West Campus on Tuesday morning. When the University finally acknowledged the bomb threats, it was through a single tweet sent from the University’s official Twitter account. Students never received a campus-wide email or text alert about the bomb threats. A man being treated for a psychiatric disorder made two bomb threats at 7:11 a.m. Tuesday — one to the North Austin Muslim Community Center at 11900 North Lamar Blvd. 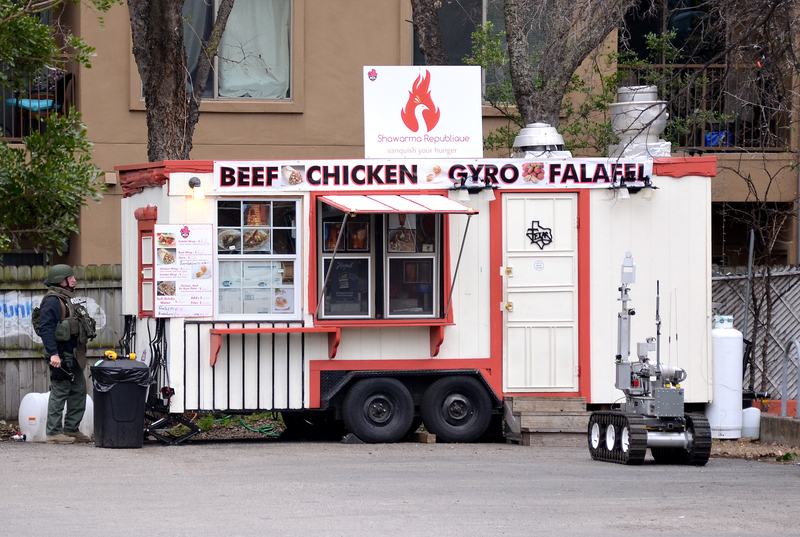 and another to the Shawarma Republique food trailer on 24th Street — prompting the Austin Police Department to block off the surrounding West Campus area, according to APD Cpl. David Boyd. University police spokeswoman Rhonda Weldon said APD did not immediately notify UTPD of the situation because there was no immediate threat to campus. “One of the reasons [APD did not contact us] is that [West Campus is] outside the Clery reporting area, which is where they normally would give us a call,” Weldon said. The Jeanne Clery Act requires universities to inform their campus communities about crimes happening on and near campus and publish an annual security report. Geology senior Julianne Milner said she thought students should have received an alert because West Campus is such a densely populated student neighborhood. After they were informed of the situation, UTPD officers went to the area surrounding 24th Street to make sure no students were involved in the threats. The man who placed the bomb threats stayed at the community center’s mosque Monday night, according to APD senior officer Surei Scanlon. APD officers declined to release the man’s name or identify the hospital where he was being treated. Economics sophomore Kareem Abdi, who said he regularly attends services at the North Austin Muslim Community Center mosque, said that after recent events targeting Muslims across the country, this bomb threat brought Islamophobia close to home. Eleanor Dearman, Adam Hamze, Samantha Ketterer and Jackie Wang contributed to this report. 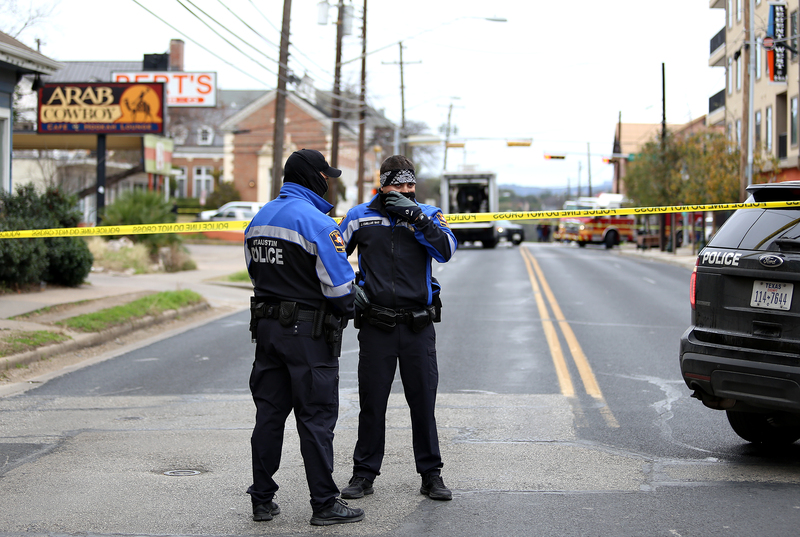 Original Story: A male being treated for psychiatric disorder made two bomb threats — one to the North Austin Muslim Community Center and another to the Shawarma Republique food trailer on 24th Street — early Tuesday morning, according to APD Cpl. David Boyd. Boyd said officers investigated the neighborhood thoroughly but found no suspicious devices. APD senior officer Surei Scanlon said the man who made the threats stayed at the community center's mosque Monday night. "The man was staying at the mosque overnight; they were providing him some refuge overnight by the mosque." Scanlon said. "I don't know his circumstances, and I don't know his identity." According to Boyd, the man, who was in his early 50s, made the call to police at 7:11 a.m. Tuesday, claiming he had placed two bombs. APD officers declined to release the man's name or identify the hospital where he was being treated. Boyd said APD is considering charging the man with making a "terroristic threat." APD officers initially reported that a bomb threat had been made to West Campus hookah lounge Arab Cowboy but later retracted this statement. Arab Cowboy employees were evacuated during the investigation. APD officers, EMS vehicles and firefighters blocked off all traffic on 24th Street from Pearl to San Gabriel streets. During the investigation, officers also evacuated occupants from an apartment complex on 24th Street. Burt's Bar-B-Que, on 24th and San Gabriel streets, was also evacuated, according to Gary Johnson, a Burt's employee. According to Johnson, police told bystanders they had spotted a suspicious vehicle in the area. Economics sophomore Kareem Abdi, who said he regularly attends services at the North Austin Muslim Community Center mosque, said that after recent events targeting Muslims across the country, this bomb threat brought Islamophobia especially close to home. Last week, three Muslim students were killed in Chapel Hill, North Carolina, and a man admitted to burning down a Houston mosque. Over the weekend, the Islamic School of Rhode Island was vandalized with slogans such as "Die Pig" and "F--- Allah Now This Is A Hate Crime." Neuroscience junior Sahare Wazirali, who lives in West Campus, said she was frustrated she had not received information from APD or UTPD over the course of the investigation. "My friend texted me saying there's a bomb threat near my apartment," Wazirali said. "I didn't get an email from APD or UT or anything." Follow @thedailytexan online for more information.